This recipe pairs winter root vegetables like potatoes and beets with the cleansing spring flavors of dill and vinegar, helping your body transition into spring. Beets and vinegar are a perfect addition to an early spring diet. They offer a healthy remedy to congested blood and liver. As they stimulate the gall bladder to release bile, they flush out burdensome fats and toxins leftover from winter, reducing triglyceride levels. Bile is also a major pathway of cholesterol metabolism. The mild laxative qualities of beets and vinegar help flush the digestive tract as well. The beta-carotene in beets is an excellent liver tonic. The spices dill and black pepper get your sluggish blood moving, causing a much-needed sweating action, much like a sauna in a bowl. Dill flushes water weight and black pepper stimulates circulation, counteracting the sedentary effects of winter’s short days. 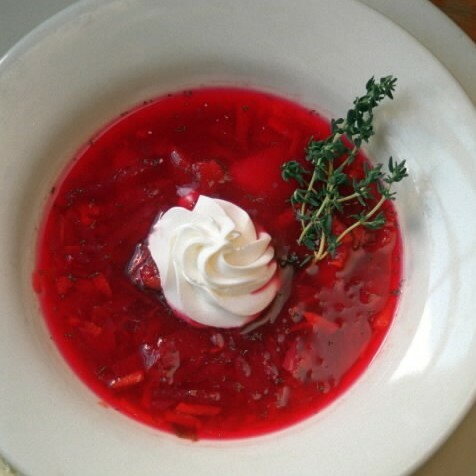 By cleansing the blood and lymphatic system, and bringing heat to the surface of the skin, borscht helps restore a healthy, vibrant glow to dull wintertime skin. Place all ingredients in a pot and cover twice the height with water. Bring to a boil and simmer, covered, for one hour or more.